She can do it! Straight from her inspirational WWII poster comes the Rosie the Riveter Action Figure. 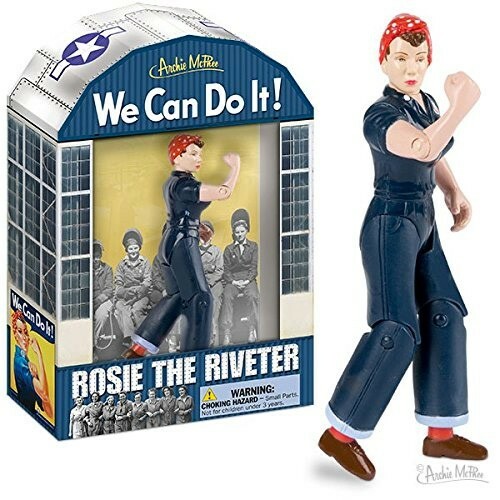 Standing a proud and powerful 5-1/4" (13.3 cm) tall, Rosie the Riveter is made of hard vinyl with movable arms, legs and head. This figure also comes with an illustrated window box. A symbol of female empowerment, Rosie will be a perfect present for anyone who needs a little boost. She's ready to lead you to victory! For more products featuring this icon of female empowerment, visit our Rosie the Riveter Collection.